There was no end to the stalemate surrounding BCCI's standoff with the Lodha Committee with the Board deciding to continue its opposition to some of the reforms suggested by the Supreme Court-appointed panel after a meeting on 15 October. "We maintain that there are certain clauses that are practically not implementable. Our legal counsel Kapil Sibal will continue with argument on Monday," a senior Board official said. The decision was reached after a meeting of the representatives of its full members, and the BCCI made it clear that 'One State One Vote, One person One post, age cap, cooling off period' remain contentious issues. The only BCCI units to have accepted the Lodha committee recommendations in toto are Tripura, Vidarbha and Rajasthan. BCCI President Anurag Thakur's affidavit, to be submitted in the Supreme Court, was also a focal point of discussions and a Board official said it would be submitted in the apex court on Monday. 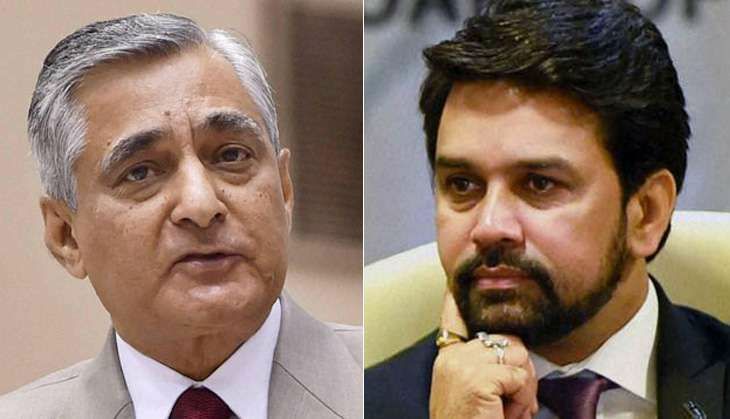 The apex court had directed Thakur to file an affidavit and clarify whether he had asked the ICC to write that Lodha Recommendations amounted to government interference. This was reportedly claimed by ICC Chief Executive Dave Richardson in some recent media interactions. With Supreme Court scheduled to hear the case on Monday, it was the last chance for the richest cricket body in world to discuss the issues which they feel will affect the functioning of the Board. At the meeting, the suspended Rajasthan Cricket Association's Deputy President Mehmood Abdi had also turned up but only met BCCI Secretary Ajay Shirke.